"How many kids do you know that enjoy eggs? We'll I thought the same until I served them my quiche!" Heat oil in a skillet over medium high heat. Add onion and saute until soft, about 3 to 5 minutes. In a large bowl, beat together eggs, cream, basil, oregano, salt and pepper. Spoon the onions into the pie crust. Pour the egg mixture over the onions. Sprinkle shredded cheese on top. 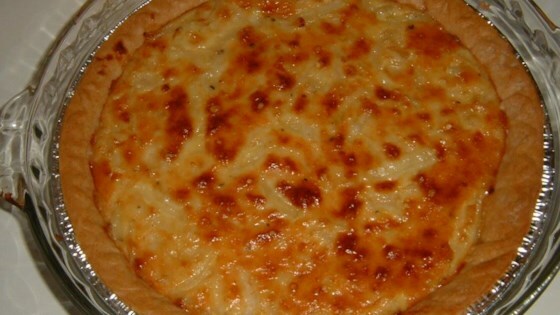 Bake in preheated oven until a toothpick inserted into center of the quiche comes out clean, about 30 to 40 minutes. Let cool slightly before serving. This was really good. I did add some things to it, but it was a great base. Best of all, my picky toddler ate it!